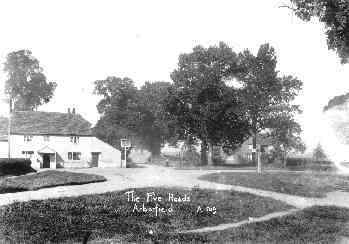 The Bushell family were connected for many years with t he 'Bull' Public House at Arborfield Cross, but Joseph Bushell only took over the pub on his retirement. He'd spent his working life over the parish border in Farley Hill. Sadly, his wife Edith died in 1921, only seven years later. "The death of Mr. Bushell, aged 94, licensee of The Bull Inn , Arborfield, since 1914, occurred on Sunday, after a short illness. Mr. Bushell was one of the oldest licensees of H. and G. Simonds, Ltd.
"Prior to taking over the inn, he was for many years gamekeeper with Sir William Simonds, at Farley Hill. "Born at Wellhouse, Hermitage, near Newbury, Mr. Bushell was educated at Thatcham. He was a keen sportsman, and took a particular interest in cricket, and used to play for the Farley Hill Cricket Club. He was also a good shot. "He leaves two sons and two daughters. The funeral took place on Thursday at Arborfield Church, the service being conducted by the Rev. C.D.T. Sparshott (vicar)." [There was also a small photo of Joseph Bushell with the article]. The Simonds family was long connected with Arborfield, Sindlesham and Farley Hill. William Simonds was brother to John Simonds of Newlands, and lived at Woodbury, which is now an old people's home. William's son Ralph was killed in a motorcycle accident in January 1916, and was buried at Arborfield churchyard. During WWI, William's wife Beatrix organised the preparation of anti-vermin garments for the men at the Front. 'Woodbury' acquired the temporary name of 'No. 2. Carbolizing Depot, Farley Hill'. Joseph's daughter May married Canadian soldier Alfred Duffield during WWI, and their wedding was recorded by the local paper here in glorious detail. May and Alfred Duffield initially lived at the 'Bull', but by 1928 they were at 8, Council Cottages, close to the 'Bramshill Hunt' pub. Alfred was on the building committee for the Village Hall, opened in 1931. By 1939, only May was registered at 8, Council Cottages. Another daughter Lilian married William Hall in late 1923, and helped to run the pub during WWII. They took it over following Joseph's death.